After Mary came and presented Rayt at the August MySQL meetup, I suggested she come to our Hackfest and I’d work on it with her. She was working up the design comp for the user interface and I started working on the bookmarklet and portal and soon we’ll have enough done to take some reasonably interesting screenshots. 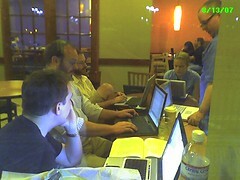 I hope we can keep the momentum up and get more folks coming to work on their projects at the Hackfest. 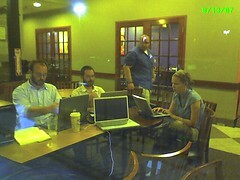 It would be nice to get someone to provide us a better venue–we currently meet at the Panera Bread in Paramus, NJ, which offers free wi-fi and is very accomodating of us, but it can be quite noisy and we usually can’t get the private room you see in the picture behind us. If you know of any organizations that would be willing to give us space with tables and chairs, a few electrical outlets, and some form of Internet connectivity for an evening every Monday night, let me know! Bloglines + IMAP + Thunderbird = offline reader. Killer app.